What the hell have you people done to my beloved game?! Still, I wish they had done a better job when it was feasible to do so. They could at the very least prevent their promotional screenshots from displaying obvious bugs, like the vertically unaligned store panels. I'm sorry, maybe I'm just blind, but I can't for the life of me see anything wrong with the image you linked. The store panel used to be centered in the middle of the screen and in one part not split in two with one piece in the top and one in the bottom. This is not only an aesthetic change, it's also an usability change as your mouse need to travel more when you use the top panel and then want to switch panels. Merging the panels also mean that they could put some work to prettify the texture used. Yeah but in 1.3 you couldn't even do fixes like that. We were utterly stuck with the UI as it was. And if someone's about to claim that the 1.3 UI was objectively perfect and without need of improvement, congratulations, that would be the first objectively wrong opinion asserted in this thread. Now, I make mods for the IE games, and in my mods, I run into bugs now and then. But because my mods usually involve utilities rather than code, my bugfixes can be as simple as tweaking a file. That process only takes a few seconds, and discovering the bug only takes a few minutes. I work with independent parts that don't interact with each other, which means that if I tweak one thing, I don't have to worry about any weird side effects. For modders like me, bugfixing is as simple as tweaking a file or fixing a typo in a single line of code. But for developers and programmers, bugfixing involves changing the source code itself, and that requires a lot of QA testing and other time-consuming chores to make sure you're not making things worse. I'm not sure where you're getting this from, but game developers don't need to touch the code to alter an object or script. They can do it the same way as you do it. The only thing that's different is that when Beamdog publishes an update, the altered files typically go into an archive instead of the override folder. As for whether this bug, or that bug, or the other bug, is understandable, that's another question. But it's worth pointing out that patching a game isn't just about changing a 1 to a 0 or replacing an old file. Patches alter the architecture of the code, and you need to test out multiple different methods of solving a problem before you actually implement it, just to make sure you don't generate new problems. It's the difference between replacing a brick in a wall and replacing a card in a house of cards. The problem is not that the structure is more fragile overall (though it is); the problem is that replacing a card has cascading effects. Sometimes, replacing one card means removing six old ones and adding eight new ones. Once again, they don't need to change the code to alter objects. A lot of bugs can be fixed without ever touching the code. And in cases where they do need to change the code, I think you're overstating the importance of the cascading effect. The whole point of object-oriented programming is to have a hierarchy of code fragments that provides you with easy access to whatever part of the program you want to change without altering unrelated functionality. Is it still possible to make a mistake and have unintended side-effects elsewhere? Absolutely. Is programming such a delicate task as to be akin to changing cards in a house of cards? Well, if it is, something's gone very wrong with your codebase. @subtledoctor And if someone's about to claim that the 2.5 UI is objectively perfect and without need of improvement, congratulations, that would be the first objectively wrong opinion asserted in this thread. I don't follow. Who ever said anything like that? You tagged me like you are arguing but I'm not sure what the argument is? On the left side, the Red highlight leads up to the UI element. 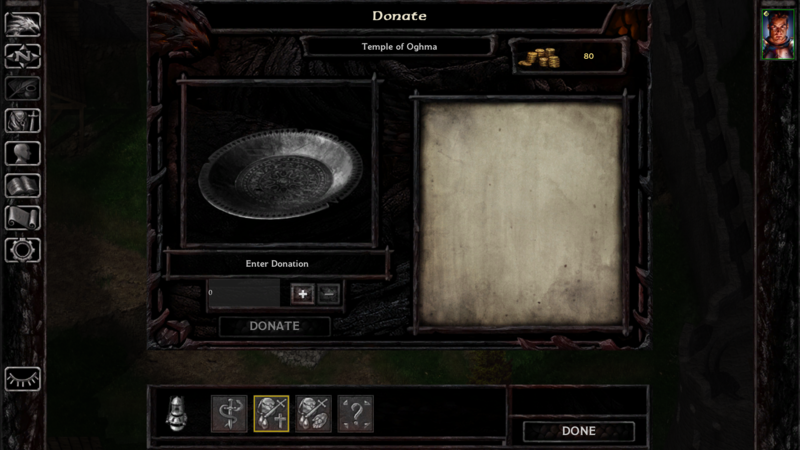 then further to the right, it runs over the UI elements, but even further to the right, it runs under the UI element. It's an inconsistent mess! The stores are just another example of a messy job. UI Scaling itself is implemented quite horribly. On 1080p screens, having UI Scaling off leaves the interface a bit on the small side. But UI Scaling on makes the UI far to big. And 1080p screens are far from the largest screens these days. 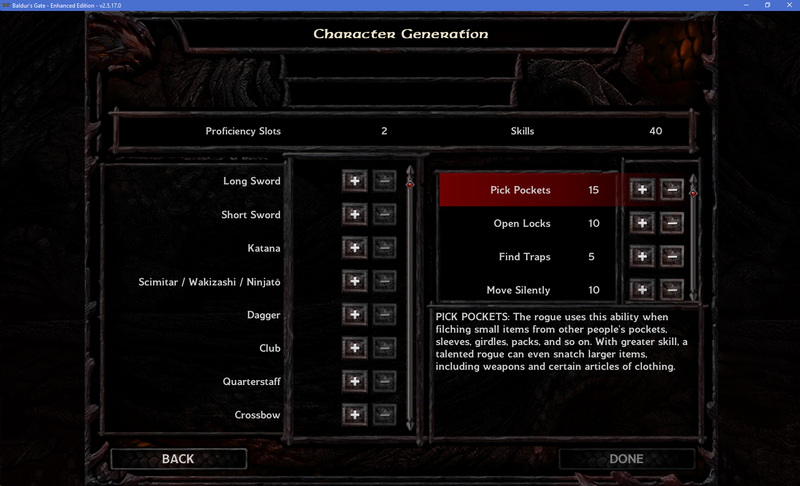 I do like the 2.x because I can just replace the horrible existing UIs by solutions such as Dragonspear UI or LeUI. However, a lot of people play games without modding them, and especially on tablets, modding is basically impossible, so a lot of users are actually stuck with the horrific 2.x interface, despite it being moddable! As for the game itself, most of the EEs are starting to become quite old by computer game standards (the EEs themselves, not the classic games they're based on). I wouldn't find it unrealistic if Beamdog was like "Hey, we've been supporting these games for several years, but enough is enough, we're moving on." What DOES bug me is that they keep making promises and then not keeping them. Shortly after 2.x came out, word came out that the 2.x interface was a bit of a rush job, and not really what Beamdog had in mind. There was a request for input, and even an entire Forum board was added purely to discuss what a potential UI should look like. A bunch of users have spent a lot of time on that board, discussing potentials, weighting pros and cons to all kinds of decisions, creating layout mockups, creating example images, writing out detailed descriptions of the concensus of what the users ended up thinking would be a smart idea, along with lots of reasoning behind those descriptions. During that time, we were informed several times that we were being heard, and that at least some of the devs would keep an eye on the discussion. That was nearly 3 years ago. We've seen naught yet. Several times, we've been informed that the UI would eventually receive attention, but it was always accompanied with "but it won't be this next patch!". 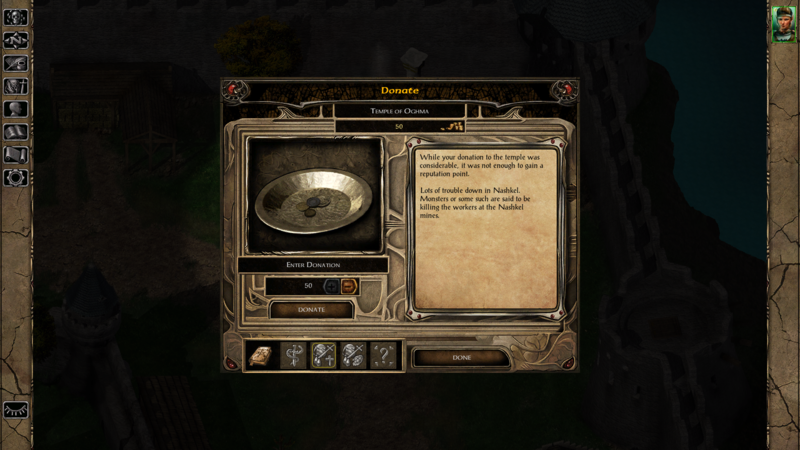 Now we get an update saying that Beamdog is looking into UI for consoles. Considering Consoles don't have a mouse, it's obvious that they need a new UI. This is brought as a good thing for our PC users, but it obviously is NOT a good thing. A UI that caters towards a controller is NOT a good UI for someone with a keyboard and mouse. It's more of a punch in the gut. "We know you have a horrible UI, but we're gonna leave that be and work on the UI for these Console people instead." The 2.6 patch is another such a thing. The 2.5 patch cycle had been extremely long. It had been well over a year since 2.3 was released before the public beta came out. But then the public beta run lasted for eight months, but with only a single test built during these eight months! So while there was public testing, there were so many more changes made to the game between the release of the public beta and the actual patch, that the public testing had basically become useless, since the public build was already horribly outdated. So... enter the 2.6 patch. We're being told that the really long, really big patch cycles aren't optimal, so Beamdog wants to return to a smaller patch cycle. Things are looking quite well for the 2.6 patch, scheduled for december, just a few months after the 2.5 patch. Not much is clear about the 2.6 patch, except that it includes support for the DCA DLC, and does not really address the UI. Well, not to worry, if we indeed get a new patch every couple of months, then even if the UI would only be updated in 2.9, it would only be a year away. But time goes by, and the only thing we hear is that it's been postponed. There's some rumors going about that the DCA DLC is holding it up, but not actually confirmed anywhere. There are only very vague posts that it's still in development, with thanks to our understanding, without actually making us understand what's going on. That is the part that bothers me. If it was a casting limitation it would both be correct per PnP and a meaningful restriction. The way it is implemented now is an annoyance to the player. Oh, I agree. That would be the best case scenario, but IDK if is even possible within the engine. If people would actually be interested in something like that I could look into it. There's also the issue of them cutting corners by reusing the same background image for menus with varying combinations or positioning of elements. In the screen you've posted (and in others), there are several frames with nothing inside them. Not to mention the unnecessarily wide margin between the proficiency labels and the +/- buttons. It doesn't seem like much, and it wouldn't be if these small instances of lazy design were few and far between. But the UI is riddled with them. The red highlights, IMHO, are the single worst thing about these UIs. It's a slab of solid color fading into a gradient over backgrounds that otherwise make extensive use of textures. It looks horribly out of place. In SoD, at least the red is part of the whole color palette. 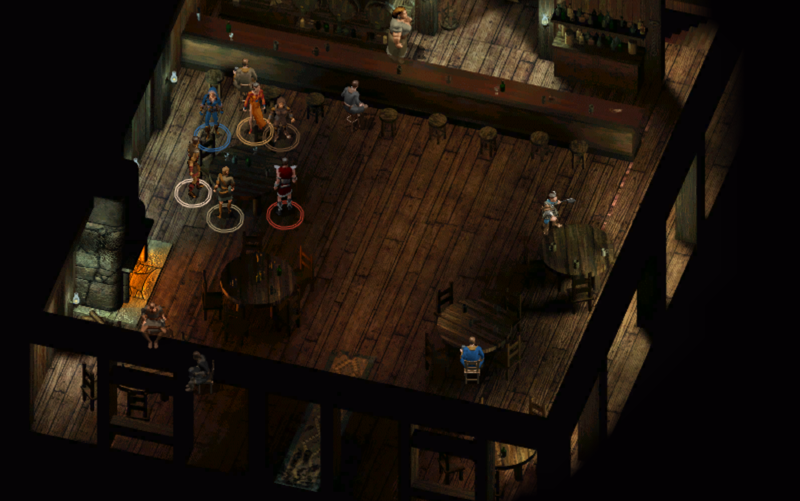 But then it got ported over to the BG:EE and BG2:EE screens, where they couldn't look more out of place. And while we're at it, might as well mention how they did away with the "lava effect" borders for highlighted buttons, instead using an artificial glow effect that just makes the buttons brighter. It hardly makes those buttons visually distinct from the others. The gap changes depending on the resolution and on UI scaling on/off. In your case, it's acceptable, but in higher resolution, the gap can be big. And I don't see any advantages of the current layout so why not keep the old one? What's holding the 2.6 patch - some things just cannot be explained at the moment. We're sorry. While we're doing our best at being honest with the community, it's not always possible to communicate certain things. "We'll do X! We'll do Y!" and then simply not delivering on those promises - wrong. Beamdog has been actually delivering everything it had promised, from SoD on mobile, to the 2.5 patch for IWD:EE, to the extra localizations for BGII:EE. It's just that the promises don't give any ETA, and if the wait is long the community comes to conclusions. It looks like even the recent blog was received as if the UI promise is broken, but it's not. We received a number of questions about UI for the Infinity Engine Enhanced Editions games and our plans regarding it going forward. Now that the console releases are announced, we can share that we’ve been doing extensive updates to our UI system that could very possibly end up paying dividends for the PC versions into the future. For the time being, however, all of the UI work we’re doing is centered squarely around the console versions of the games, so any changes to the PC UI won’t happen for a while. Catmull-Rom Bicubic scaling causes all kinds of issues on mobile, this is why it was removed with 2.0. Yet, Luke says that the possibilities of bringing it back based on the constant community request are being explored. "could very possibly" is very evasive though. Don't get me wrong, I love BGEE, BG2EE, IWDEE and BGSOD, and I love Beamdog for delivering those to us. I also do think the current implementations are in a very playable state (if you are in a position to mod away the horrible interface). I just don't expect much more from Beamdog in the future. That is fine. It's been ages since some of these EEs have been released. What about shorter patch cycles? What about the "Making it work" threads? Can you blame us when some of it hasn't been delivered on for almost 3 years? That's incredibly vague, and it doesn't sound like you're doing what we're asking you to do. When will you actually fix the UI regressions that appeared in the game with the 2.0 patch? I must add that I was one of the patient iOS users, that eagerly awaited SoD for iOS. Many iOS-players and forumites did get impatient, and many saw the wait as a sure sign that Beamdog would abandon the IE. They where wrong, and we did get the game eventually - as promised. The wait is long, but I am confident that we havent seen the last from Beamdog on the IE (I feel like a 2017 echo). History may prove me wrong, but I still believe. Maybe I remember incorrectly, but I think it's the first time I see an official answer as to why it was removed. Frankly I'm not buying it. Let's set aside the fact that I don't recall ever seeing a complaint about Catmull-Rom causing issues on mobile devices—I don't read every post on these boards and I might have missed them. Let's also set aside the fact that I seem to remember their saying they needed Bilinear to enable sprite contours and highlighting when 2.0 was released—I honestly can't be bothered to go hunt for that post, and it's been a while so I might again be mistaken. Why would they remove Catmull-Rom from all devices if only mobile devices were having problems? PC could have easily kept it. Not so easily because it would have entailed maintaining different builds, you say? But PC and mobile builds are already different and maintained separately, are they not? But let's say they weren't—when people complained about the blurry filter, why were they given the option to go with Nearest Neighbor (advertised as "the previous scaler" even though it had never been there in the first place) instead of an option to revert to Catmull-Rom? With that said, I'll put the dream to rest along with many others I had for the Enhanced Editions. So I'm still hoping both EAX and Catmull-Rom will make it back in at some point. Not holding my breath, though. Are there comparison screens to show how it looks like with Catmull-Rom? I see it being talked a lot recently but I have no idea how it is different visually. If you remember what the game looked like when zoomed-in at release, that was Catmull-Rom. EDIT: Perhaps someone on GOG can revert to 1.3 to take a screenshot fully zoomed-in, then take the same in 2.5 and post it here? EDIT II: Fairly sure I actually posted comparison screenshots from IWD:EE in the past. Will try to dig them up later. I found the comparison screenshots over here. I'm pretty sure these are the ones you're talking about. @AndreaColombo indeed there are differences when zooming in. v2.5 seems to use Nearest Neighbor. Thank you very much, @lefreut and @Flashburn . Best way to compare is to click on the screenshots to open a bigger version in a different tab, then switch across tabs. Nearest Neighbor looks sharp, but pixelated; Bilinear is too blurry. Catmull-Rom is like the best of two worlds. No pixelation but lots of clarity on the details. I really miss it. Pretty much. All that's left is a little ESRGAN treatment on the 2D backgrounds and all will giggle happily ever after. Heck, even NwN: EE really could use a bit of ESRGAN love. If ESRGAN increased the size of assets too much for mobile, I'd be more than happy to download upscaled assets as a separate package, like a DLC that needs installing after the game. 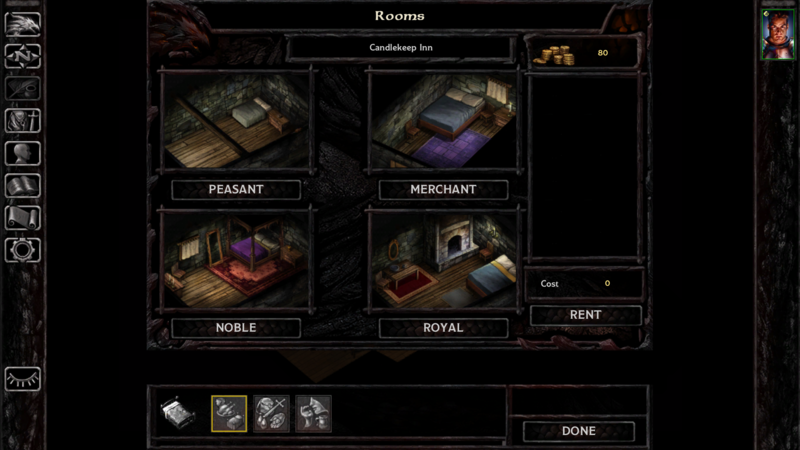 It would be a godsend not just on the backdrops, but on sprites, paperdolls, spell icons, and item icons as well. @Kilivitz correct me if I'm wrong but UI elements in the Enhanced Editions are approximately 25% bigger than in the original games. Using ESRGAN would enable us to make paperdolls, item icons and spell icons also 25% bigger (thus retaining the original proportions) with no visible loss in quality. EDIT: To reiterate for the benefit of those less well-versed in these matters—ESRGAN and Catmull-Rom do different things and can be used in conjunction. They are not mutually exclusive. Indeed, using both simultaneously would net us the best visual quality these games could hope to achieve. It would be interesting to do a blind test of this - give a group of people say 10 different sets of screenshots of images taken using different techniques and see if there is a consistent preference. If that was the case that would be a decent argument to use that it should be adopted, even if that did cause some additional technical headaches. Looking at just these sample images myself I doubt that I would have a consistent preference (though I can see they're not identical when blown up and laid side by side). However, I appreciate that others will view them differently / more acutely (and my vision is not as good as it used to be in any case ). @JuliusBorisov would that sort of test be something Beamdog would be prepared to be involved in (particularly if some of the work was done by community members)? Apart from anything else that would help demonstrate that there is indeed a willingness to consider change where there's good reason for that. Hey, since Beamdog is moving on from doing EEs, maybe some other studio could come along, purchase all the rights, and release BG:EE:EE. 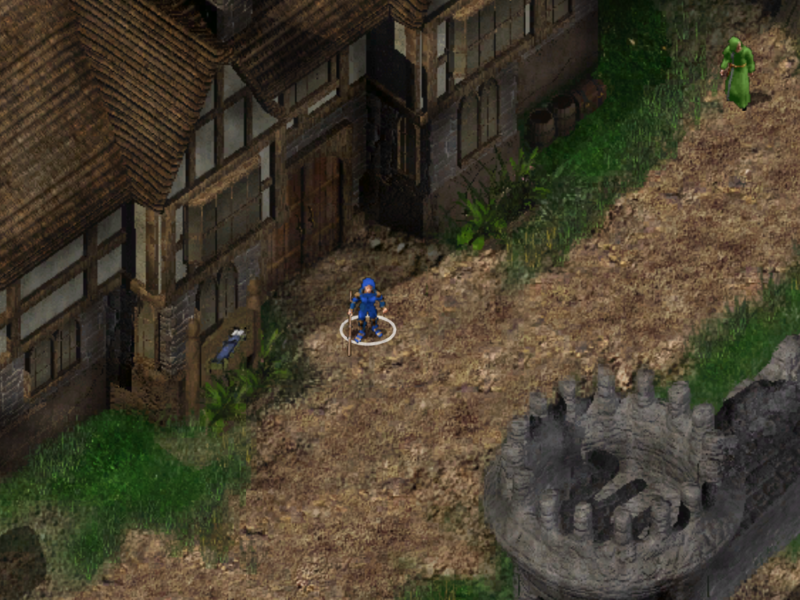 Or maybe BG:REE (Baldur's Gate: REALLY Enhanced Edition)? Thanks a lot guys. Now that I have seen the comparisons, I also agree that Catmull-Rom looks better than both of the other options. I hope they bring it back. But now that I've seen it, I'm curious. If this was available with v1.3, then what was the reason behind removing this functionality? Does anyone know if it was mentioned somewhere? Catmull-Rom Bicubic scaling causes all kinds of issues on mobile, this is why it was removed with 2.0. Baldur's Gate: Helluva Definition Edition? Now Actually Enhanced Edition? Visual Edition? As Intended Edition? One Edition To Rule Them All Edition?